Back when I used to watch lots of Microsoft keynotes, I always noticed how awkwardly Steve Ballmer held his arms; at times it made him look practically ghoulish! 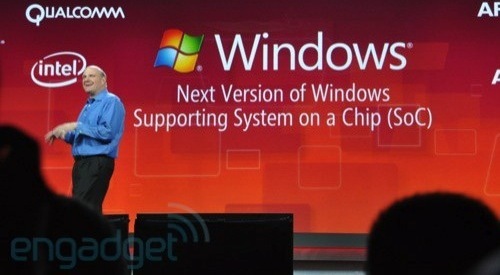 Judging from this photo from Engadget, he's still doing it. We can't all be Jobs or Ellison when delivering sales pitches; heck I twitch and flail my limbs all over the place when speaking! Still, as the CEO of a company trying to shed its evil overlord image, perhaps he could stand to gain from some lessons! I… love… this… company! Developers developers developers developers! Sorry, it had to be said.